This week It was really good to see one of our favourite kitchen designs from last year featuring in Houzz, possibly the biggest online interior design community that there is. The kitchen that was featured was one that we had particularly enjoyed creating, sharing ideas and design elements with its new owner and designer Hianta Cassam Chenai. Working with Hianta from HCC interiors, we loved this project and the scope of the brief for recreating this stunning, sleek and rather minimalist kitchen within a Georgian house on the river bank here in Devon. As with all of our kitchens, functionality is key and this kitchen was no different, despite the lack of obvious kitchen-like looks ! As the article explains the only obvious kitchen traits visible are the taps and the oven. During the restoration work carried out on this Georgian property some extra space was found alongside the kitchen which helped to keep the space clean and uncluttered. It was in fact an old coal cellar that was rediscovered and is now home to the boiler, washing machines and a few other items best kept out of a kitchen if at all possible. So from a kitchen design perspective, it is beautifully simple and breaks away from the usual remit. Essentially this contemporary kitchen is neat and ingenious consisting of the back wall and an unusually large kitchen island. Walnut was the timber of choice and great effort was made to select the grain-matched pieces that worked together. The doors and drawers open to reveal a plethora of practical storage for dried food and fresh food plus the dishwasher, ovens and freezer. When not in use and with doors and drawers closed the effect is amazing. 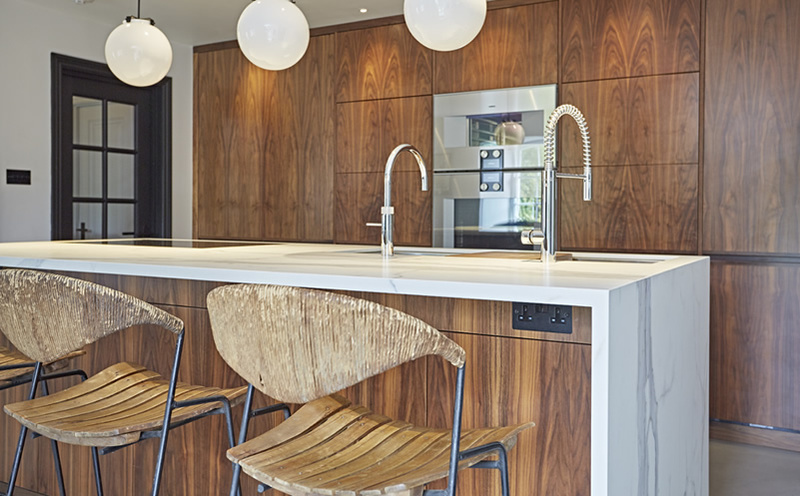 Small detail like the omission of handles makes the walnut expanse more inspiring. All kitchen doors and drawers are push to open which allows these beautiful clean lines and also adds the benefit of being easy to keep clean. This approach was also focused on when creating the back wall floor-to-ceiling joinery, with no upper cabinet tops there is no space for dust to gather !